Open house Monday MLK Day 11:30-1pm! 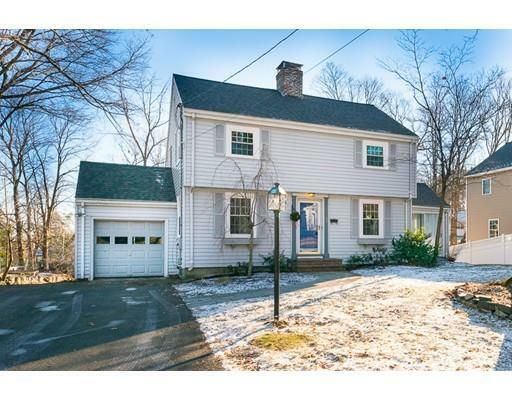 Garrison Colonial in picturesque family neighborhood in Westwood...Minutes to highway, shopping at Legacy Place and the commuter train stop. Walk to nearby main street shops and playground. Desirable Westwood schools, Hanlon elementary. Spacious family room with cozy fireplace/tv area open to vaulted ceiling with skylight for playroom or dining area. Tranquil 3 season porch. Full finished basement with recreation room, fireplace, bar area, and remodeled 3/4 bath. Walk out slider to serene back yard space with blue stone patio overlooking small brook with foot bridge. Half bath on 1st floor, full bath upstairs. Four bedrooms with generous size closes. Fourth bed is smaller in size and may function as a nursery or child's bedroom, act as an office, hobby space, or even more closet space. Roof is approximately 3 years young. Updated 200 amp electric service. Windows replaced within the past 2 years. Forced hot air heat with C/A in the summer months.